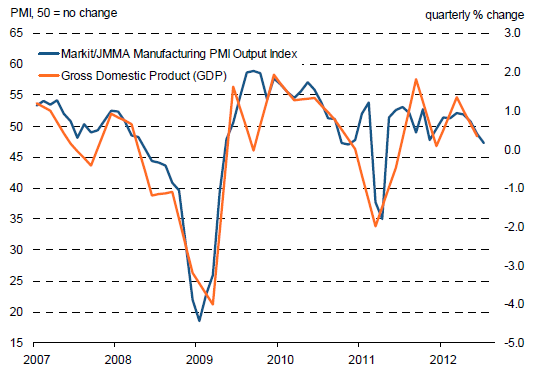 Japan Manufacturing PMI Hits 16 Month Low! After adjusting for seasonal factors, the headline Markit/JMMA Purchasing Managers’ Index™ (PMI™) posted 47.7 in August, down from 47.9 one month previously, signalling the sharpest worsening of Japanese manufacturing sector operating conditions since April 2011. Moreover, the latest deterioration in business conditions was broad-based across all three market groups. Japanese manufacturing production declined further in August, with the rate of contraction accelerating to the fastest in 16 months. The latest reduction in factory output was the third in as many months. Reflecting falling new orders and corresponding spare capacity, backlogs of work decreased further in August. The rate at which firms depleted work-in-hand (but not yet completed) was sharp, and the steepest since May 2009. Japan is in its third deflationary decade in spite of massive fiscal stimulus, massive monetary stimulus, and the major industrial world’s highest debt-to-GDP ratio. US demographics are not as bad, but US consumer debt overhang and student loans are worse. The deflationary forces facing Bernanke are massive.